Deep orange and dark leafy green vegetables are packed full of vitamins and minerals, and I feel lucky to love them both. In fact, I especially like them together and am often looking for recipes that combine them on the plate. Here's something I came up with when I found myself with a bounty of Delicata squash and two bunches of Red Russian Kale. Cook the squash: Preheat the oven to 400 degrees. Line a large baking sheet with parchment paper or foil. Place the sliced squash on the lined baking sheet and sprinkle with olive oil (about 2 tablespoons) and salt. Toss together with your hands, then spread out into a single layer. Cook for 30 minutes, flipping the slices every 10 minutes or so to prevent them from browning too deeply on one side. Prepare the greens: While the squash is roasting, remove the kale ribs, rinse the leaves, and cut the leaves into ½-inch ribbons. Pour enough oil to skim the bottom of a large skillet and warm over medium heat. Add the onion slices and pepper flakes, and cook until the onion has started to soften. Add the kale ribbons and a big pinch of salt; continue to cook, stirring often, for 10 to 15 minutes, until the greens are lightly browned and wilted. Remove from the heat and season to taste with salt and vinegar or lemon juice (start with a teaspoon). Prepare the sauce: In a small bowl, whisk together the tahini, lemon juice, salt, cumin, and garlic; if the mixture is too thick to whisk, add just enough warm water to make it easy to stir. Add the yogurt, and whisk until smooth. Season to taste with salt. 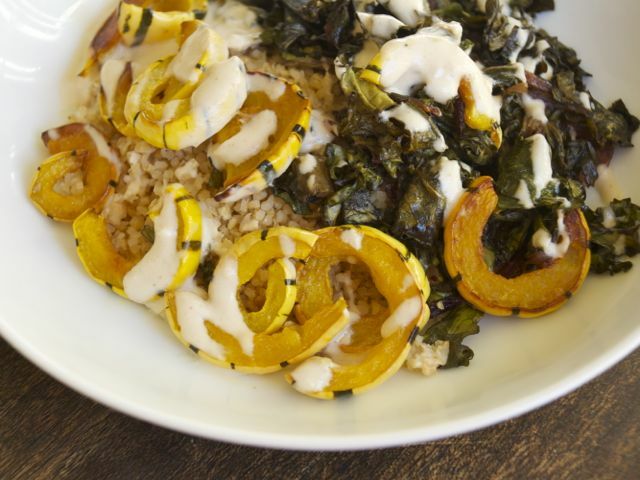 To serve: Spoon the warm grains into individual shallow bowls, top with the roasted squash and sautéed greens, and drizzle with the tahini-yogurt sauce.